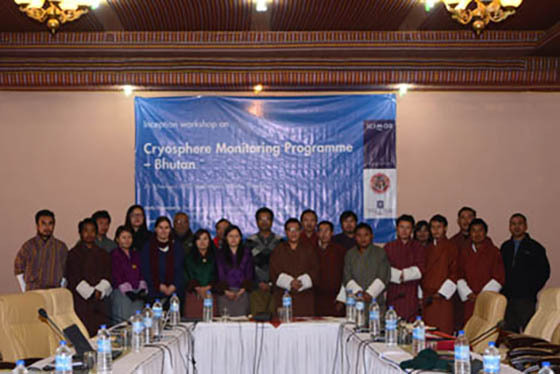 The Cryosphere Monitoring Programme in Bhutan (CMP-B) kicked off with an inception workshop held on 2-3 February in Thimphu, Bhutan. The CMP-B is a four-year programme funded by the Norwegian government and coordinated by the Department of Hydro-Met Services (DHMS), Royal Government of Bhutan (RGoB), with technical support from ICIMOD. The main focus of the programme is to build the capacity of national agencies including DHMS for long-term cryosphere monitoring in Bhutan. The two-day workshop brought together 22 participants from over 10 different organizations. The project management team briefed the participants about the different components and activities of the programme, followed by a detailed activity level planning. Team members from the Cryosphere Monitoring Programme in Nepal (CMP-N) shared their experiences and learning with the Bhutanese team. Speaking at the opening session of the workshop, Karma Tshering, Director of DHMS, highlighted the need to build national agencies’ capacity to undertake scientific studies on cryosphere. Such studies would help build understanding of available water resources and the risks faced by downstream communities in the face of climate change. He thanked ICIMOD for supporting Bhutan in this initiative. 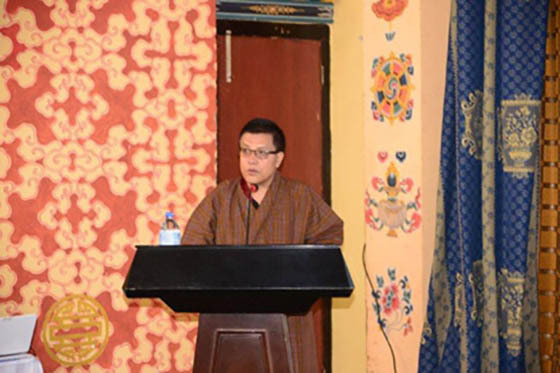 Dr Arun Shrestha, Programme Manager at ICIMOD, thanked DHMS and expressed hope that CMP-B would pave the path for long-term monitoring of cryosphere in Bhutan. Karma Tshering, Director of the Department of Hydro-Met Services, delivers the opening remarks at the workshop.